When you have a heavy-duty rotary broaching application, these adjustable center Rotary Broach holders are very capable and built with Swiss precision. Already well known in Europe, PCM®'s Rotary Broach holders are some of the finest available to the machining industry. Capable of making a hex broach anywhere from .040" - 1-1/8", these broach holders have a wide range of capabilities and uses. 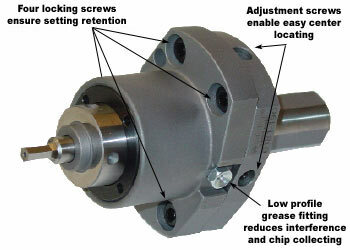 Ideal for CNC Machining Centers, Turning Centers or Rotary Transfer Machines where center locating is required to get an accurate broach. You've messed with the rest, now try the best. - Fully Adjustable in X and Y Axis for easy set-up and quick center locating. - Comes pre-set for center from Factory for use with PCM® 8mmØ x 28mm OAL broaches. Our Largest Broach Holder, Ideal for heavy broaching jobs that require hex forms from .375" to about 1-1/8" in diamter. An excellent choice for large machining centers and Turning centers. 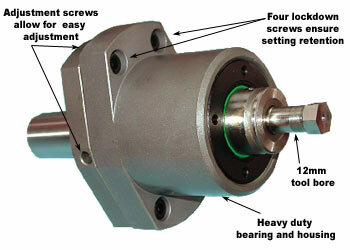 - Ultra Heavy-Duty bearing withstands 9000lbs of thrust force. - Capable of machining the largest of forms. - Uses 12mm Ø Shank Broach Tools.